From the hit-making producer of The Rock and Crimson Tide comes the hard-hitting blockbuster Con Air, starring Nicolas Cage (National Treasure, Gone In 60 Seconds, The Rock), John Cusack (Grosse Pointe Blank, High Fidelity), and John Malkovich (In the Line of Fire, Dangerous Liaisons). A prison parolee (Cage) on his way to freedom faces impossible odds when the maximum security transport plane he's on is skyjacked by the most vicious criminals in the country ... led by the infamous murderer Cyrus "The Virus" Grissom (Malkovich). 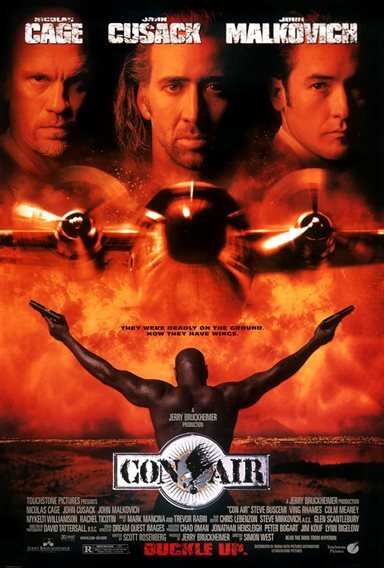 Download Con Air in Digital HD from the iTunes store. Con Air images are © Touchstone Pictures. All Rights Reserved. Garland Greene: What if I told you insane was working fifty hours a week in some office for fifty years at the end of which they tell you to piss off; ending up in some retirement village hoping to die before suffering the indignity of trying to make it to the toilet on time? Wouldn't you consider that to be insane? Cyrus Grissom: I despise rapists. For me, you're somewhere between a cockroach and that white stuff that accumulates at the corner of your mouth when you're really thirsty. But, in your case, I'll make an exception.